3-Rhoda Mary Appleby was born on 23 Dec 1870 in Westbury, Tasmania, died on 6 Oct 1938 in Ulverstone, Tasmania at age 67, and was buried in Ulverstone, Tasmania. Rhoda married John Smith on 31 Aug 1887 in Deloraine, Tasmania. John was born on 29 Oct 1863 and died on 18 Jul 1929 in North Motton at age 65. 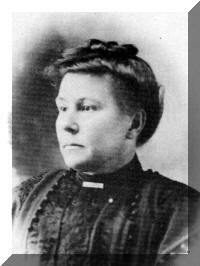 At the very early age of 16, Rhoda married John Smith at the Wesleyan Church in Deloraine, on the 31st August, 1887. John was a farmer and was 23 years old. Rhoda and John lived at Mole Creek for a time in a house on the side of the hill above Den Plains, later moving to Northdown and then to Barron Hill onto a property known as "Wattle Grove". Rhoda and John were not able to have children of their own, so adopted a son whom they named Albert, who was killed while on active service during the First World War, and 2 daughters, Doris and Gladys. The family moved to Ulverstone for a few years where John ran a livery stable behind Furners Hotel, hiring coaches and horses to both locals and tourists. John also groomed horses and polished and treated saddlery. Their move back to "Wattle Grove" in late 1920's was short-lived as John died suddenly while talking to friends by the roadside. Rhoda returned to Ulverstone, opening a tearoom in King Edward Street. Rhoda Mary passed away in October, 1938. Both Rhoda and John are buried at Ulverstone. 4-Albert Smith† was born on 2 Jun 1893 in Ulverstone, Tasmania and died on 20 Sep 1917 in the First World War in Belgium at age 24. 4-Doris Smith was born on 24 Feb 1908 and died on 24 Jan 1983 at age 74. Doris married Jack Reid. Jack was born on 1 Feb 1898 and died on 10 Aug 1974 at age 76. They had five children: Kathleen, Elton, Ralph, Malcolm and Leon. 5-Kathleen Reid was born on 9 Jun 1930. Kathleen married Clarence Marshall. Clarence was born on 19 Nov 1919. They had six children: Pixie, Avalon, Gaylene, Peter, Adrian and Katrina. 6-Pixie Marshall was born on 11 Feb 1948. Pixie married Trevor Cox. Trevor was born on 8 Mar 1945. They had two children: Damien and Justin. 7-Damien Cox was born on 12 Aug 1970. 7-Justin Cox was born on 27 Nov 1972. 6-Avalon Marshall was born on 1 May 1950. Avalon married someone. He had one daughter: Sharon. 7- Sharon was born on 17 Apr 1970. 6-Gaylene Marshall was born on 25 May 1952. Gaylene married Don Wells. Don was born on 26 May 1951. 6-Peter Marshall was born on 24 Aug 1958. Peter married Patsy Fullager. Patsy was born on 19 Nov 1961. They had three children: Emma Jane, Sarah Louise and Peter James. 7-Emma Jane Marshall was born on 21 Apr 1984. 7-Sarah Louise Marshall was born on 23 Aug 1986. 7-Peter James Marshall was born on 15 Feb 1988. 6-Adrian Marshall was born on 24 Aug 1958. Adrian married Elizabeth Geraldine Van Zelm. Elizabeth was born on 22 Nov 1967. 6-Katrina Marshall was born on 8 Apr 1972. 5-Elton Reid was born on 8 Jun 1932. 5-Ralph Reid was born on 10 Jul 1936. Ralph married Amy Florence Hiscock. Amy was born on 7 Jun 1935. They had four children: Stephen, Karen, Alison Kate and Ellen. 6-Stephen Reid was born on 22 Jul 1957. 6-Karen Reid was born on 15 Sep 1958. Karen married Murray Arthur Smith. Murray was born on 14 Jun 1956. 6-Alison Kate Reid was born on 12 Sep 1963. Alison married Bruce Smith. Bruce was born on 11 Jul 1957. They had two children: Garry and Ellen. 7-Garry Smith was born on 27 Dec 1980. 7-Ellen Smith was born on 4 Nov 1982. 6-Ellen Reid was born on 8 Aug 1965. 5-Malcolm Reid was born on 9 Jul 1942. Malcolm married Margaret Barber. Margaret was born on 15 Dec 1945. They had five children: Matthew, Cameron, Joel, Megan and Sion. 6-Matthew Reid was born on 20 Jun 1968. 6-Cameron Reid was born on 15 Oct 1970. 6-Joel Reid was born on 26 Jul 1971. 6-Megan Reid was born on 2 Jun 1974. 6-Sion Reid was born on 23 Nov 1976. 5-Leon Reid was born on 24 Jan 1949 and died on 3 Mar 1980 at age 31.